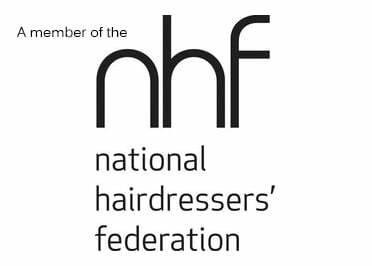 I would like to thanks you again for having teach us all your skills about the hair replacement. It was an intensive week for me but I did not regret. I came back in France with a strong knowledge and a plenties ideas. I am sure it will be more than helpful for my business. Now I am looking for a place to welcome future client. 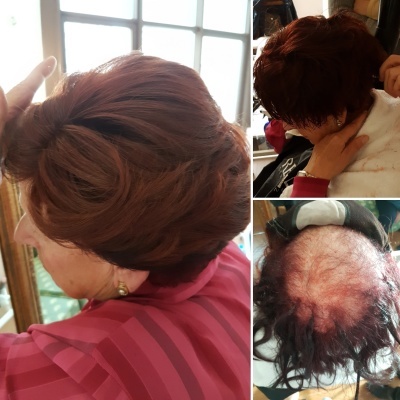 I would love to show you some of my work, in the past 10 months my business has really grown, i am looking into opening up a salon. 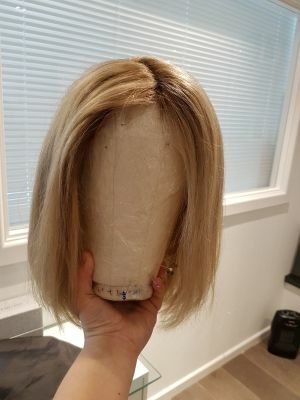 i have someone working for me and lots of clients buying wigs. Can't thank you enough for the amazing courses you run. 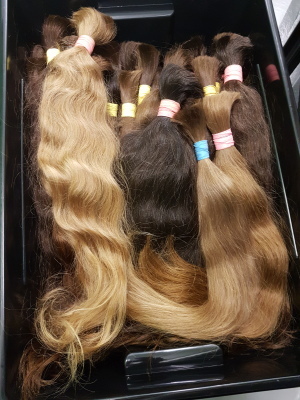 My hair replacement business is rocking along well now. I wanted to sleep on the plane but it was impossible. My brain could not stop thinking! I realised with this course that i did not give enough value to my work. What you have given us during this more than 24 hours is disproportionate, priceless, incense, incredible! I'm so happy that since the first day of training i have wanted to cry and thought of ideas to improve my business. Why give us so much? I do not understand ! 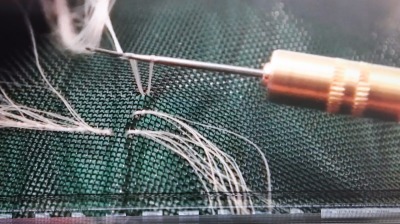 Your techniques, tips, secrets, methods of selection, procedures, standard documents, suppliers! Things that you had to put so many years to collect and develop you offer to us on a golden platter. I feel that this training will change my life into the right direction. For 5 years i worked as a bitter for my clients and my husband yells that i underestimated and that i do not see the potential and the "luxury" side of this work.Thanks to you i now understand. With this beautiful certificate (Which has become the screen of my cell phone!) I trust in my business. Although i have a master's degree in management, i've never felt as being "Someone". Now it's done, i'm someone with real expertise, a craftsman, a connoisseur and passionate with this job. This e-mail is long and I apologise but i wanted to say thank you a thousand times for the transmission of knowledge. 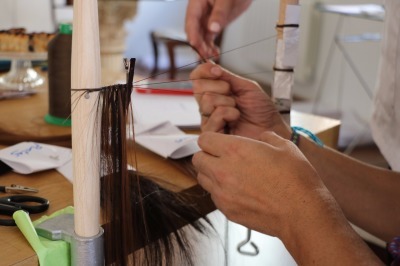 All aspects are dressed in a methodical and rigorous methodology. With a great deal of practice in addition, your training is so full and so rewarding that i wonder if it is possible to do better. Thanks to you, I think my work and business will take another turn and I'm going to chain sleepless nights to put everything in place this summer!!! You are a great trainer, teacher and very patient but also a wonderful and generous person and i think there are not many people like you. Thank god to have met you. May god reward you a hundredfold! You, your 2 great collaborators and loved ones. Of course, i will keep in touch with you!!!!!!! 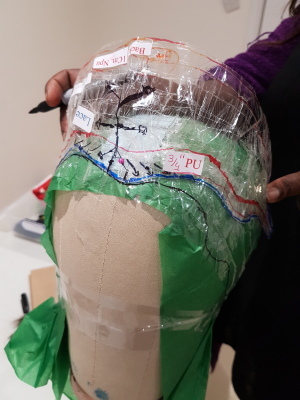 I was so pleased with the 3 day course that I took with Rosa, this course has changed my career and have taken it to a greater level, Rosa teaches from expierience and love which has made this course well worth the time and money. 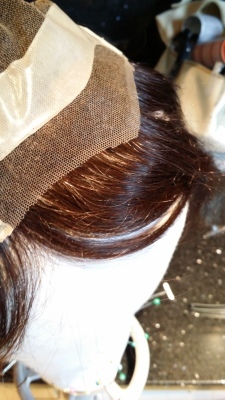 I'm able to produce a line of wigs as well as restoring any wig. 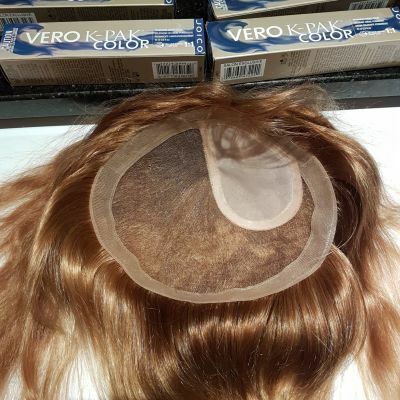 I have great contacts and enough pertinent information for the best quality human hair and wig making materials that is needed. I highly recommend this course to those who are seeking for the best service of teaching with a qualified teacher, Rosa thanks for your support and all of your time. You are greatly appreciated!! , estais haciendo una labor muy bonita en expandir este arte tan necesario pero tan apagado hoy en dia, estoy deseando poner a todas mis chicas a trabajar con todo lo aprendido en tu curso y despegar ya!! cuando salga en la lista Forbes,que sera muy pronto, os llamo !!! To Rosa: you are a beautiful tutor, beautiful inside and out,Thank you so much for your kindness and patience; please keep in touch. Carol. Birmingham. 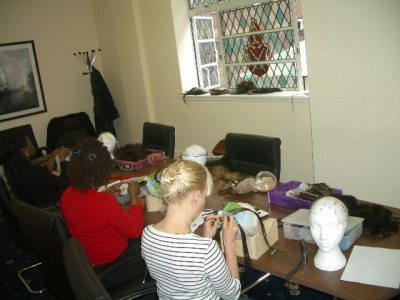 I loved this course I have been fitting and customizing wigs for about nine years. It was time I learned how they were made. Rosa is so patient and a joy to learn form. I wish I could have spent a month with her. I have to say I learned a lot in three days. 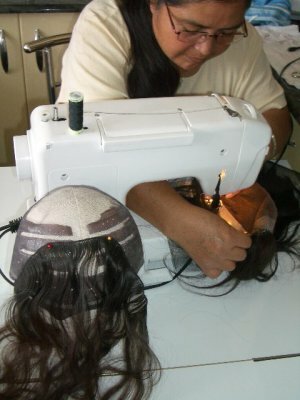 She is so passionate about wig making that even through lunch we discussed wigs. You will leave her course with a new direcion for your buisness. I have already started changing my website to reflect the quality that I offer my clients. Thanks again Rosa you inspired me! I just want to thank the 'UK school' for the profesionality and at the attention they showed me, but specially Rosa, a really great teacher. I have to admit that wihtout Rosa, I could have never started my own business. Thanks to all from Mexico !! I just want to thank Rosa for all her support through this, my first year of business. Withouth her I could not have dreamt of all my achievements. Im really happy to have found them after searching for a long time. Thank you Rosa for this amazing course, you have save me & my family to go to Korea and learn far less for far more, you are truly a good person and a giver. G-d Bless. It's been a week since we took the course and it’s like it should have never ended, it went so quickly and I'm amazed how much we consumed in just 3 days. Thank you for your style of teaching which was very warm and welcoming with a concern for our future business venture picking up quickly. Thank you for this 3 days I cannot believe that you teach us so much, you are the warmest and more charismatic tutor I ever had, Just wish I would have known about this career before I did my expensive trainee as a hairdressers for 3 long years, the money I am going to earn making wigs and extensions does not justify to work for a salon anymore. 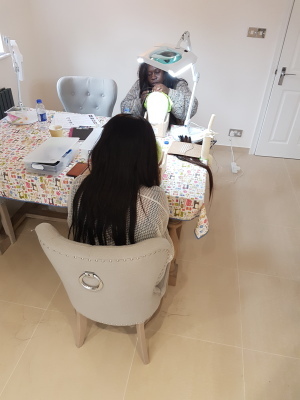 Rosa & Team, thank you so much for your generosity and all your extra time through out the course, the new knowledge is exactly what I needed it in my freelance business as make up artist. Rosa you are such an angel! And such a bloody good business woman, I just want to be like you! 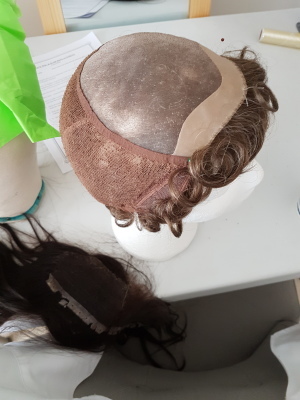 I want to say thank you to Uk wig school but Rosa is special for her good methodology and high professionalism through out the course, she engages and commits herself 100% to her students and go that extra mile all the time. Rosa you have given me far more knowledge that I was expecting.. 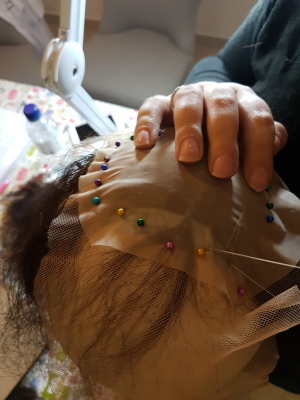 I was very apprehensive about coming to London to learn wig making and hair replacement, I have had bad experiences with courses before, I found you guys and your prices where a fraction of most renown professional wigmakers but you promise to condensed years of knowledge in this 3 days course, so I was not expecting much but a soft beginner course, I have been very impressed with the methodology and style of this very intensive course and the knowledge of the teacher, Rosa, she is the kindest yet strong tutor we all should find at least once in a lifetime. Thank you Rosa and a big hello to my fellow students, lets keep in touch ! Rosa, I recommend you and your school to anyone! 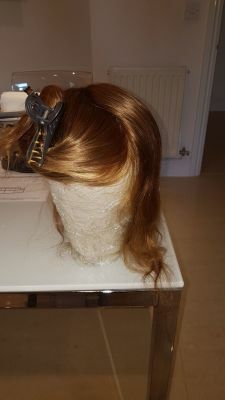 you are so kind, well inform, knowledgeable and up to date about all to do with the whole wig business (hair systems as you obligate to call it) I have such a high since finishing the course, thank you for your patience and time with me and I know the others feel the same, I feel I can create and design anything from scratch to any future possible client regardless of their hair loss and I always wanted to work in this field but never found an appropriate course. 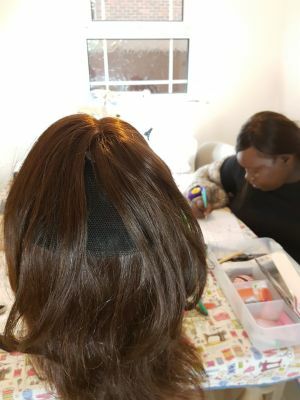 I just want to thank you and recommend Uk wig school and Rosa for her expertise in helping me to start my own business from home doing what I love most and I would certainly recommend whole-heartedly this excellent course “3 in one” mega intensive method whether you are a beginner or an advance professional. Dear Rosa, I just though to drop you a line to say a big thank you for the quality of training we all received, the knowledge and advance were superb covering all the syllabus and far more, although we had to cover a lot in such a short period, a weekend, your school training method and hands on work was extremely professional, clever generous and friendly. You are very rare in today’s industry. 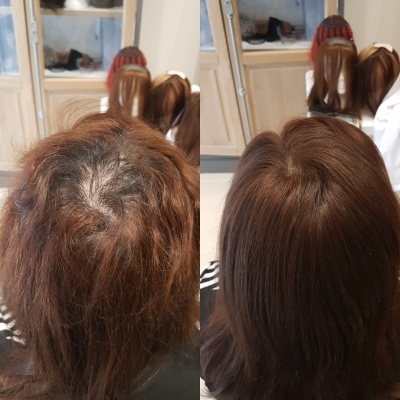 In 7 months since finishing my course you have answered all my queries and helped me to design and execute my first hair systems for my new clients all of the volumizers and integrations were of extreme perfection and highest quality, I could never have done that without the knowledge I acquired back in January with you. 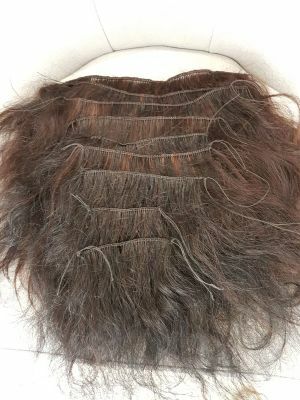 I am planning to move to a bigger house soon so I can have an exclusive room only for my hair loss clinic. 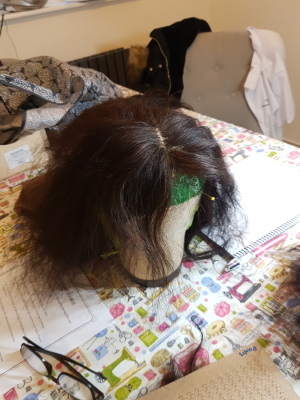 I have just completed my 3 days wig making trainee and I really enjoyed it, found the course excellent, it was a lot to learn but it is taught in such a relaxed way by Rosa, that you cannot believe how much you have learnt by the end of it, nothing is a problem for Rosa, The course have give me the confidence to go out there and start a new chapter in my life. Once again thank you and pass on my many thanks to all your staff. 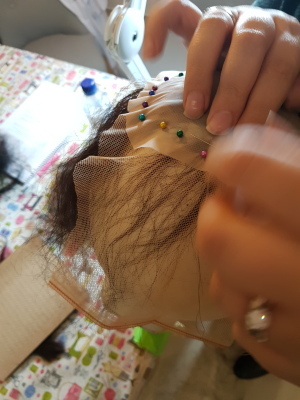 “I travelled from across the world to experience the training offered by Ukwigschool, I worked with prosthetics and cosmetic beauty before, but I had no real knowledge about the crafting of wigs. Rosa, the director of the school has enlightened me about the art. 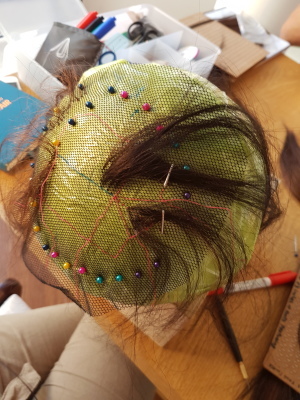 I will be leaving my job as a secretary soon and I am on my way to open up my own business as a wig maker. I want to thank the school for their patience in me as they put up with me despite the fact that I am a slow learner. Rosa and her team have also been keeping in touch with me and answering all questions I have had since completing the course in their own free time, which is something that really has amazed me. Hello Dear Rosa, I can not praise you enough, you couldn’t have done more to help me in my new career, I am so so excited, it was lots to learn but you make it in such a easy and fun way. 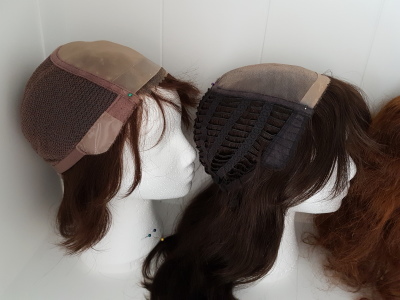 I was very impressed with the course and I m now confident after all the practice with you to launch my new wig/toupee business at my salon, so far so good but I will keep you inform ! 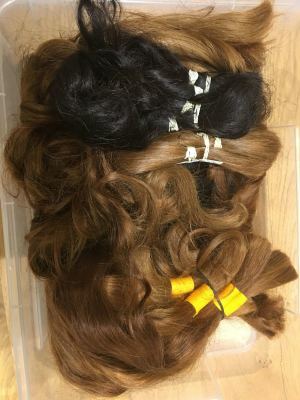 Rosa has provide me in just 3 days with the most profiting business I could have ever dreamed about and I have had very good business ideas/plans before, Through out the course we have learn how to make the finest wigs and how to design then too, also she teach us how to start our own hair business and hair extensions of the highest quality, it has been a lot to take in but very enjoyable, I don’t think that nowhere in the planet you can get so much for so little. It is quite a smart course plan. This is the ideal business with minimum investment maximum return. 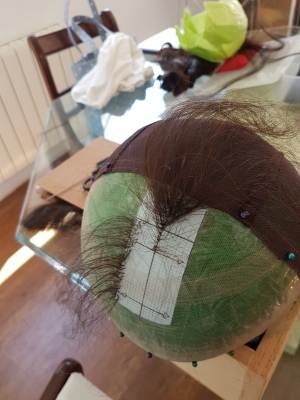 My name is Jane and straight after the course I could produce my own hair system with just a little guidance from my teacher. This was fantastic, especially after all the wasted money I have spent throughout the years. 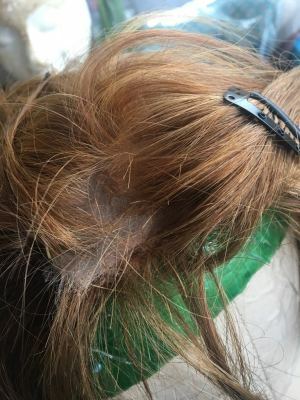 She is really nice and friendly and I recommend this course to anyone in need of hair replacement because you wouldn't have to buy any again. 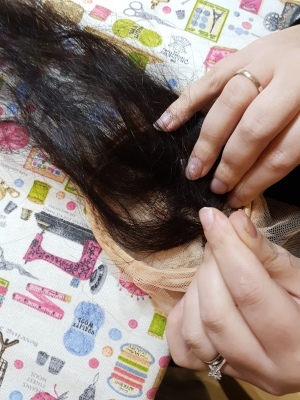 I know that the other students were there for different reasons, to start businesses or they were into hair salons and stuff, but that was my reason. 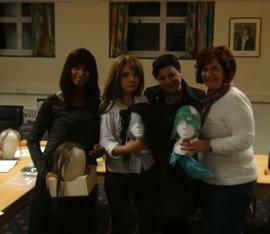 Hi Rosa this is Theresa, and everyone .The course was so useful in setting up my own business. Thanks to Rosa I can be now be independent and have time for my son as I've been able to leave my job. You are a big inspiration and a gret coach, thank you for your knowledge! Thank you for being a brilliant teacher and helping me to focus more on my business plan to help others. .You inspire me and motivate me. Rosa thank you for kind approach to life and for teaching me so much, without you on my life I could have never done what I am doing. Your school it's the best ! Hope you are well. 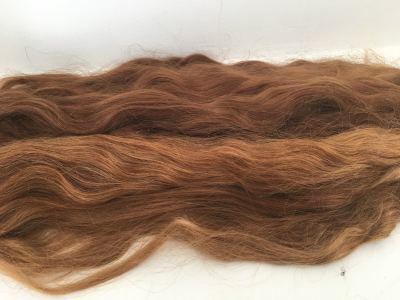 Every client that I have made a piece for has ordered another from me. Thank you for all your help I wanted to let you know that my business is going well. Thank you Rosa for everything, it was great to meet you and I enjoyed my visit in London very much! Hi, just to say thank you for all the knowledge you transmitted to us .You are a wonderful woman and generous may God bless you always. 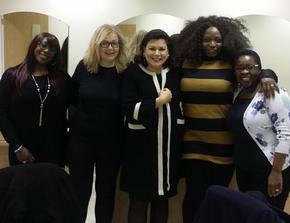 Rosa and her team were fantastic.Rosa is a wonderful lady! 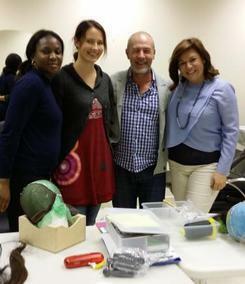 I enjoyed my course and have learnt so much more than I expected! Thank you to you all! I have an exciting future ahead! 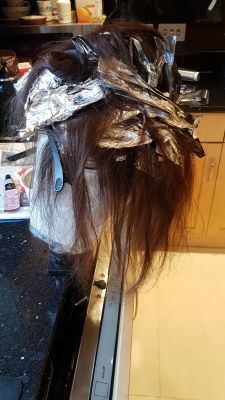 I just wanted to say a big "Thank You" for teaching me how to do the Volumizer System, on my one to one course on the 29th and 30th July. I had such a good time learning this new system. You are an excellent teacher, patient and kind with your time, and you made me feel at ease, throughout the whole course. I cannot express how much I learnt within the two days of the course. I will keep in touch, to let you know how I get on with my new found career. Once again, thank you so much.